Mangalore Refinery and Petrochemicals Ltd (MRPL) is a petroleum oil refinery located near Jokatte village in Dakshina Kannada district. It is a subsidiary of state owned Oil and Natural Gas Corporation Limited (ONGC). The plant has been established in 1993 and recently made an expansion plan (in the third phase) of the plant. For this process MRPL has recently acquired about 274 acres of land at Mangalore Special Economic Zone (MSEZ). It has invested about Rs 15,000 crore for this expansion plan. Further the plant is going to commission the polypropylene plant by the end of December 2014 . The effected residents living in the nearby villages of the plant protesting against the refiner for causing alleged air, noise and water pollution. Residents claimed that they are falling sick because of the nauseous smell and fume. There are also many health alignment arises due to the increasing level of pollutant in the atmosphere surrounded the refinery. The residents of the surrounding villages are suffering from many diseases and their health is deteriorating due to the coke and sulphur manufacturing units. 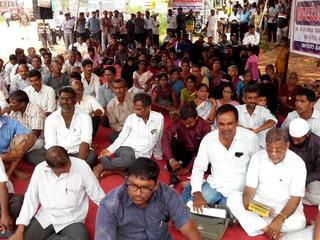 In October 2014, villagers planned a massive protest rally in Mangalore against the pollution caused by the plant. They also stage protest in front of the office of deputy commissioner, Dakshina Kannada district, and submitted a memorandum to the government officials . “ Nagarika Horata Samiti” and “Democratic Youth Federation of India (DYFI)” supported the local peoples’ movement. Their major demand was that the authority should either acquire the lands affected by the “pollution” from the plant or shut down the operations of the plant . Project Details Mangalore Refinery and Petrochemicals Limited (MRPL), is an oil refinery located at Mangalore. MRPL is a subsidiary of ONGC and established in 1993. MRPL acquired 274 acres at Mangalore Special Economic Zone (MSEZ) to expand its refinery in the third phase. It has invested about Rs 15,000 crore for this expansion. According to MRPL website, the Refinery has got a versatile design with high flexibility to process Crudes of various API and with high degree of Automation. It has a design capacity to process 15 million metric tons per annum and have 2 Hydrocrackers producing Premium Diesel (High Cetane). It also has 2 CCRs producing Unleaded Petrol of High Octane . Development of Alternatives Villagers are demanding that the government to close down the sulphur and coke plants. The pollutants from the plant are spreading many other villages nearby which causes serious health hazards for the local people. Annoyed by the pollution caused by the plant, many villagers are willing to give away their land to the plant and move away from their village. Following complaints from the people of Jokatte Village, Karnataka Minister for Environment & Forest had appointed an expert “Technical Advisory Committee (TAC)”. The committee will do the necessary inspection and talk to the affected people. According to the Newspaper Business Standard report on October 11, 2014, the fact finding report by the committee is waiting . Why? Explain briefly. Protestors claimed that after the recent expansion, the plant is increasingly emitting pollutants in the surrounding areas. As a result, residents were falling sick because of the nauseous smell and fumes. They are demanding immediate suspension of sulphur and coke plants. The water in the nearby lake and wells has been contaminated. Even fish has disappeared from the lake. They want the government to take immediate action and ask the company to close down the sulphur and coke plants. They also observed that the company had failed in building up a green belt around the new plant to shield residents against the pollution. So they demanded that MRPL should either acquire the lands affected by the “pollution” from the plant or shut down the operations of the plant . However company officials denied all allegations and claimed that they had taken all possible pollution control measures directed by the government agencies. They also claimed that they regularly check air and water quality in the surrounding areas and their report shows that there is no cause for concern for the people of surrounding areas. The company is willing to do necessary modifications if recommended by the experts .